Although Table Mountain is one of the “New Seven Wonders of Nature”, Bobotie is in actuality the true Wonder of South Africa. This traditional South African dish, pronounced “bu-booah-tea”, is deeply rooted in South African history and my kitchen. “Food had almost everything to do with the fateful or, as many of their countrymen might now view it, baleful decision of white men to establish themselves in the city that is known today as Cape Town, at the tip of the African continent. In the beginning – that means 329 years ago – the Dutch East India Company was not at all interested in colonizing the Cape of Good Hope, only in setting up the 17th-century equivalent of a truck stop there for its Java-bound ships. Within months the company’s men had their kitchen gardens under cultivation; within a couple of years, their first vineyard. The ships that called at Cape Town on their way back to Holland from what is now Indonesia started depositing spices and, a little later, Malay-speaking slaves to work in the kitchens of the whites. Thus, almost from the start the ingredients were on hand not only for racial conflict but a distinctive cuisine, blending Eastern and Western influences. That, in short, is how bobotie was born – but more of that later. When the British took over the Cape in 1806, this native cuisine was very nearly driven underground. ”One of the most depressing factors of eating in southern Africa,” Laurens van der Post, the writer, remarked, recalling his childhood, ”is the complete absence of our national dishes from the menus of hotels, restaurants and trains.” Yet until the apartheid era, these dishes survived on Cape Town’s side streets in Malay ”cook-shops” specializing in ”kerriekerrie” (curry in Afrikaans). With the increasingly strict application of the country’s racial codes, the only truly indigenous cuisine was forced to retreat even further into the segregated residences of white and brown South Africans, becoming steadily less accessible to visitors. The ”slegs blankes” – whites only – restaurant scene was then dominated by immigrants from Italy, Greece and Spain – who found it profitable to serve a pretentious, lethally rich ”international” cuisine that systematically violated the best food traditions of guests and hosts alike. Bobotie is one of my favorite meals of all time and whenever I cook for friends it is my go-to classic. The seemingly strange yet complimentary ingredients create an explosion of flavors that make all people, no matter what their food preference, food-gasm. 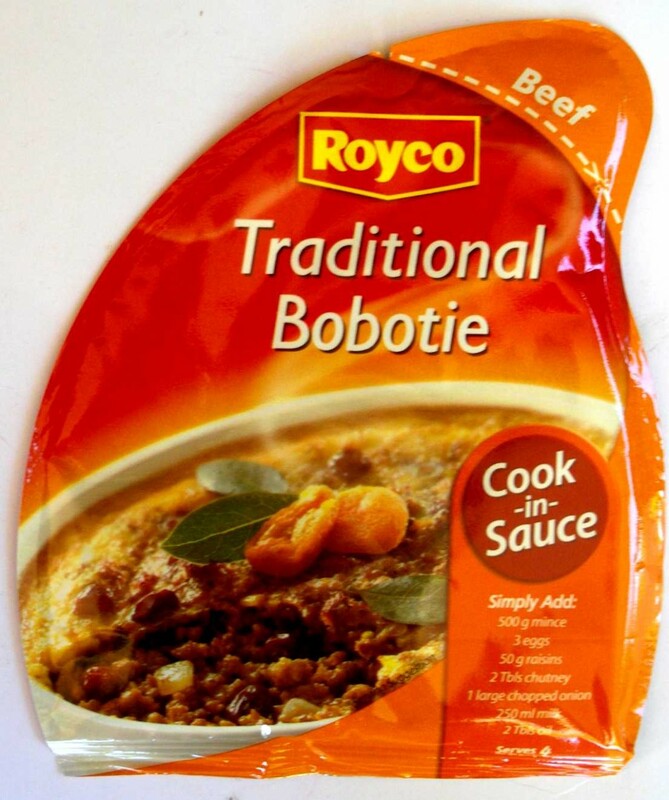 The ratios within Royco’s Traditional Bobotie packet are perfect and it requires minimal effort on a lazy night. In addition, I always add a few dashes of sugar and a few more dollops of chutney. Preheat the oven to 180C (350F). Sautee the onions in a small amount of oil until golden, add the spices, and stir for a minute or so until fragrant. Add the mince and cook until browned. Next add the milk, water, vinegar, raisins, and chutney. Break up the milk-soaked bread into pieces and add to the mixture. Bring the mixture to a boil, reduce the heat, and let the mixture simmer and thicken for about 15 minutes. Pour the mixture into a deep oven proof pan. In a bowl, beat together the eggs and about 3 tbsp of the leftover milk from the soaked bread. Pour an even egg layer over the mixture. Bake for approximately 30-40 minutes or until the egg layer is fully cooked and has turned a nice golden brown. Serve the bobotie with rice and voila! Follow the bobotie recipe as described above except only use about 150 ml milk and 50 ml water. Cut off the tops, clean out, and lightly oil four peppers (I bet red peppers would be even more awesome than green). Sprinkle some salt and pepper inside the pepper-shells. Next spoon layers of rice, bobotie, and egg into each shell. 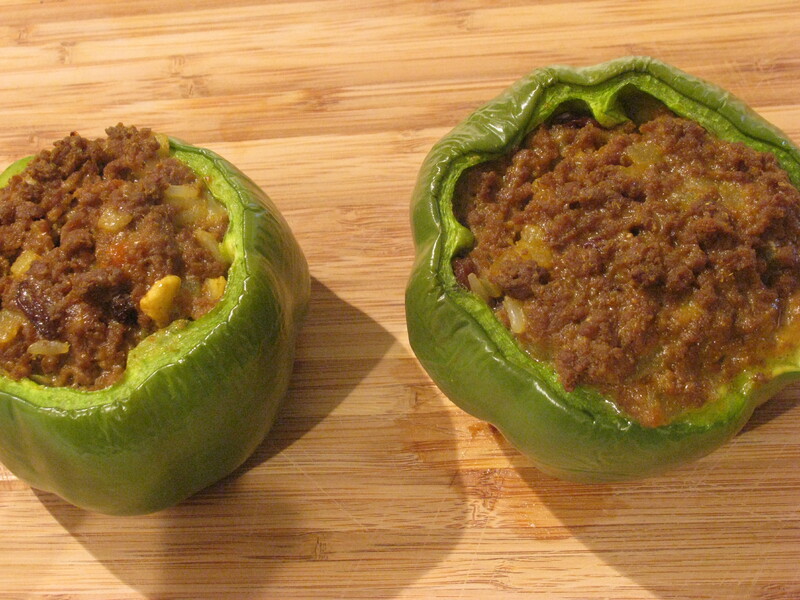 Bake for 30-40 minutes or until the peppers are nice and soft. 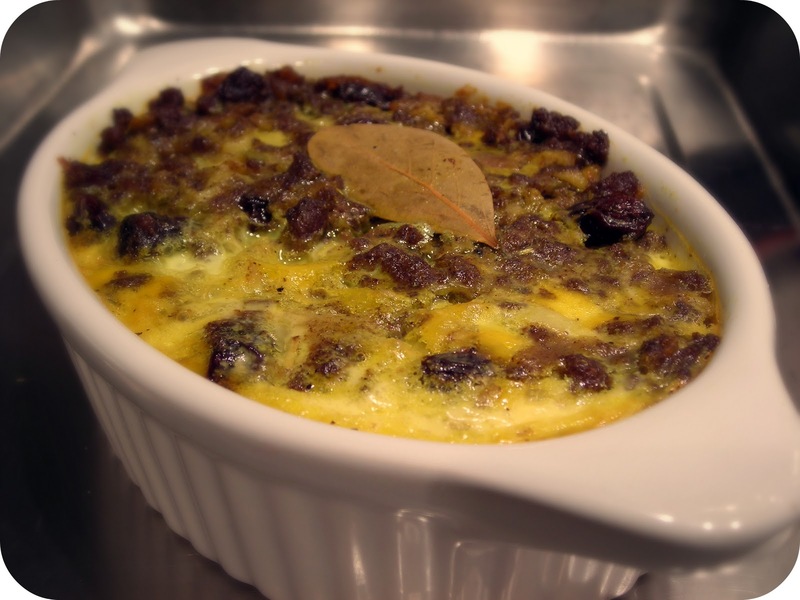 Bobotie burgers – mix onion, garlic, spices, vinegar, chutney, and 2 eggs with raw minced beef. omit the raisins, milk, and water. form into patties and either braai (South African colloquialism for barbeque) or grill in a pan to desired done-ness. serve on burger buns with lettuce and tomato.